Seafood Restaurant – food with a view! Right on the Dickson Inlet in picturesque Port Douglas there perches a seafood restaurant that dishes up the very best fresh, locally sourced produce possible. On the Inlet seafood restaurant provides locals and tourists with a unique dining experience. Suspended over clear tropical waters On the Inlet seafood restaurant boasts incredible views of the water and the jungle covered mountain range. During happy hour you can watch the boats that have visited the Great Barrier Reef returning as they cruise right past the restaurant. On the InletSeafood Restaurant has established relationships with local fishermen. This results in a supply of the freshest seafood available in Port Douglas. 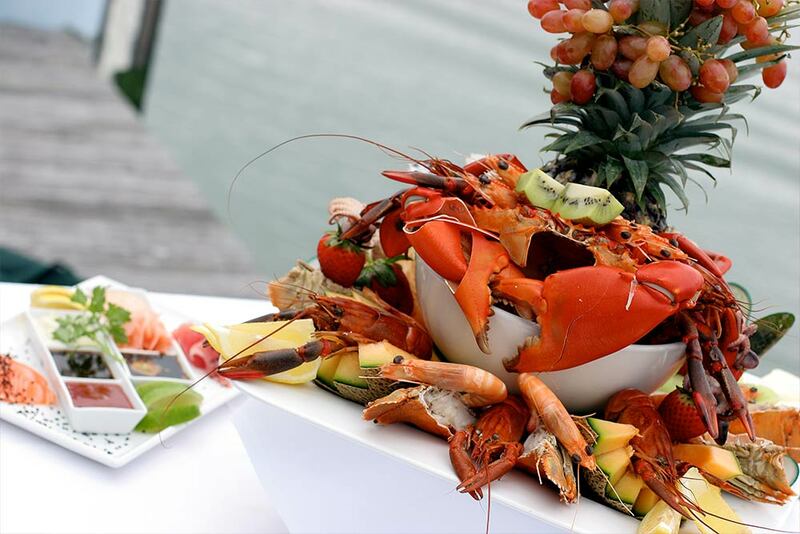 The ultimate menu choice at On the Inlet Seafood Restaurant would have to be the incredible seafood platter for two. The seafood platter for two consists of local prawns, Red Claw Yabbies, Oysters, Sashimi, Mussels and a whole mud crab. The seafood platter at On the Inlet seafood restaurant comes with chips, salad and dipping sauces to complete the meal. The seafood platter is the ultimate dish for seafood lovers. Another dish of note would be the whole fried Coral Trout. Coral Trout is a local fish with firm white flesh. baby Barramundi are also prepared in this way. On the Inlet seafood restaurant also has a live tank for those that like Mud Crab. The mud crab is cooked fresh to order and served with Singapore Chilli sauce or Lemon Butter. For lovers of Curry- Mohan’s fish curry is a must. Another unique feature of On the Inlet Seafood Restaurant is the Groper feeding. Every day at 5.00pm the giant groper that lives underneath the restaurant is fed. It’s a real show to see a 200kg fish chomping on the fish frame provided by the staff. For a relaxed and fun dining experience that combines beautiful views, the freshest produce and great hospitality, try On the Inlet. On the Inlet Seafood restaurant gets quite busy- always best to make a dinner reservation. Call them on 07 40 995255 to make a booking. This entry was posted in Food, Restaurants and tagged Barramundi, Coral Trout, Fresh, local, Mud Crab, views, waterfront.